Florida State will play Auburn in the BCS Championship on Monday, Jan. 6 at the Rose Bowl in Pasadena, Calif.
Florida State offensive lineman Michael Scheerhorn wants to make the BCS title game against Auburn a special night for one child who is battling cancer. The sophomore has two personal tickets to the game and he’s giving them away to a young girl and one of her parents. He just needs to raise money to get the family there and pay for all of the expenses of the trip. HELP ME SEND A CHILD BATTLING CANCER TO THE BCS CHAMPIONSHIP GAME IN PASADENA! Hi! My name is Mikey Scheerhorn and I am an offensive lineman with the FSU SEMINOLES who will be playing in the upcoming BCS Championship game in Pasadena, CA on January 6th. When my brother Daniel was diagnosed with Medulloblastoma – a form of brain cancer - it was devastating to my entire family. Everything changed in a heartbeat. While Daniel’s medical team worked to cure his cancer, we soon found that it was going to take more than medicine for our whole family to beat this thing which had so suddenly and dramatically invaded our lives. The Children’s Cancer Center understands that, and we were fortunate to receive their help. They provided all kinds of day-to-day support for our entire family at a time when we needed it most. Now I would like to pay that kindness forward, so I’m sending a child and her parent to the BCS Championship game in Pasadena! I have two tickets for them from my personal allocation, but I need help getting the family there. The total cost will be around $5000 including airfares, hotel stay, car rental, etc. and it is my dream that together we can raise that money here so that the Children’s Cancer Center will not have to spend a single penny. CAN YOU HELP? Donating any amount – from a few bucks to a few hundred – is appreciated. Every bit helps. 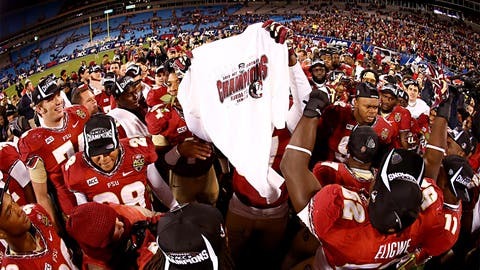 Thank you – and GO NOLES!